Joplin Humane Society is committed to making high quality, low cost spay/neuter services accessible to all pet owners in the Four State region. JHS makes it easy to have your pet "fixed" with convenient drop off and pick up times, friendly, helpful staff and a variety of services to suit your pet's needs and your budget. Our low-cost spay/neuter clinic is conveniently located in our shelter on Emperor Lane in Joplin. The clinic offers low-cost spay/neuter services to pet owners with no restrictions based on income or location. The cost to neuter or spay a cat is $35; all dogs are just $50 regardless of size. All pets over 4mos of age will be required to have a current rabies vaccination. Pets that are not current will be given a rabies vaccination for a cost of only $10. Vaccinations are available ONLY at the time of spay/neuter . surgery. We do not offer a vaccine/wellcare clinic at this time. ​PLEASE NOTE WE DO REQUIRE A $10 NON-REFUNDABLE DEPOSIT AT THE TIME YOU SCHEDULE YOUR PET. THIS WILL BE APPLIED TO THE SERVICES RENDERED THE DAY OF THE SURGERY. PLEASE BE ADVISED THAT ANY PET COMING IN TO THE CLINIC WILL FLEAS WILL RECEIVE A CAPSTAR PILL WHICH WILL KILL ALL FLEAS WITHIN 30 MINUTES. THIS IS FOR THE SAFETY OF YOUR PET (FLEAS CAN JUMP IN AN OPEN SURGERY INCISION) OUR TECHNICIANS ( FLEAS JUMP ON THEM) AND OUR CLINIC AND OTHER PETS (FLEAS CAN JUMP OFF OF YOUR PET AND END UP IN OUR CLINIC AND ON OTHER PETS. YOU WILL BE CHARGED $5 IF YOUR PET RECEIVES A CAPSTAR. Click here to see a full list of services available for your pet! Vaccines and other extra services are only available in conjunction with having a pet spayed or neutered. 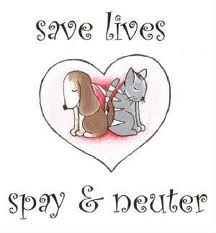 Our veterinarians are experts and specialize in spay/neuter surgeries. Last year alone, our veterinarians performed more than 3000 spay/neuter surgeries. Our clinic staff members are caring, compassionate and well trained. All pets are monitored throughout recovery. Sutures are dissolvable so no return visit is necessary. We can spay and neuter animals as early as 8 weeks old or 3lbs. All animals go home same day of surgery. Take home pain medication is available for your pet's comfort and your piece of mind. To set-up an appointment, please contact us by phone at: 417-623-3642 or by email at: clinic@joplinhumane.org.